Home How To Trade Options? Options trading permits traders to control a stock for a fraction of its share price without actually owning it. Options trading can be extremely risky due to leverage and volatility and it is important to learn everything about options trading strategies before venturing into this world. Once you have the necessary knowledge tough trade options will be a very important way of making profits regardless of what is happening in the overall market. What are Options and Options Trading? Simply speaking options are conditional derivative contracts that permits the buyers of the contracts, also called option holder, to buy or sell a security at a determined price. Option buyers are however charged a fee that is called a ‘premium’ by the sellers to have this right. If the market will move in the wrong direction for the option holders, they will have the opportunity to let the option expire worthless: in this case they will ensure that the losses are not more than the premium. The options sellers, also called option writers, will take bigger risk than the option buyers and this is why they do ask for a fee. Options are separated into ‘call’ and put’ options. A ‘Call Option’ is when the buyer of the contract acquire the right to buy the underlying asset in the future at a price that has been agreed. This price is called exercise price or strike price. A ‘Put Option’ is when the buyer is acquiring the right to sell the asset in the future at a determined price. Why Trade Options Rather Than a Direct Asset? There are some differences and some clear advantages to trading options. The Chicago Board Of Option Exchange (CBOE) is the biggest exchange in the world and it offers a huge variety of options like single stocks, ETFs and indexes. Traders can decide which strategy to use from buying or selling a single option to a lot more complex ones that do involve taking lots of different positions at the same time. Below we have presented the basic option strategies that can be used for beginners. Since options are leveraged instruments they permit traders to increase the profit by risking small amounts of capitals that would otherwise be necessary to buy the underlying asset. A standard option contract on a stock is based on 100 shares of the underlying security. Let’s make an example so you understand better: let’s imagine that a trader wants to invest $5,000 in Apple (AAPL) which is at around $165 per share. With this capital the trader will be able to buy 30 shares for $4,950. Now let’s imagine that the price of the stock will increase by 10% to $181.50 the month after. If we exclude brokerage commission and transaction fees we can say that the trader’s portfolio will increase to $5,445: the trader in this case will have a net return of $495 which is 10% on the capital he has invested. Now let’s imagine a call option on the stock with a strike price of $165 that will expire in 30 days will cost $5.50 per share or $550 per contract. Considering the traders budget he or she will be able to buy 9 options for a total cost of $4,950. As mentioned every option contract controls 100 shares so effectively the trader is making a deal on 900 shares. If the stock price will rise 10% to $181.50 on the day of the expiration the option will be worth $16.50 per share ($181.50 – $165 strike) which will be equivalent to $14,850 on 900 shares. This means that the net profit would be $9,990 which will be equivalent to 200% on the capital invested: this is lots more than compared to trading the underlying asset directly. 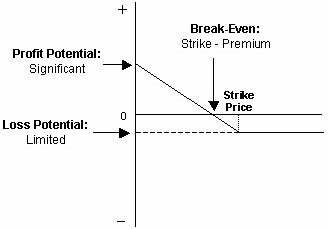 Risk/Reward: The trader’s potential loss from a long call is limited to the premium that has been paid. The potential profit on the other hand is unlimited as the option payoff will increase together with the price of the asset until it will expire so there is no limit to how high it can go. A put option does work in the same opposite way as a call option: the put option will increase in value if the price of the underlying asset will decrease. Short-selling will also allow a trader to make a profit from falling prices but the issue is that the risk with a short position is unlimited as potentially the price can continue to rise indefinitely. 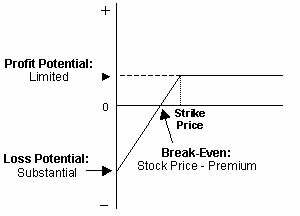 By having a put option the risk is limited as if the underlying asset will rise past the option’s strike price than the option will just expire worthless. Risk/Reward: the potential loss is limited by the premium that is paid for the options. In this case the maximum profit from the position is capped as the price of the underlying asset cannot drop below zero. In the same way as a long call option the put option does leverage the trader’s return. A covered call strategy consists in buying 100 shares of the underlying asset and selling a call option against those shares. When the trader sells the call he will get the option’s premium. This will lower the cost basis of the shares and will give some downside protection. 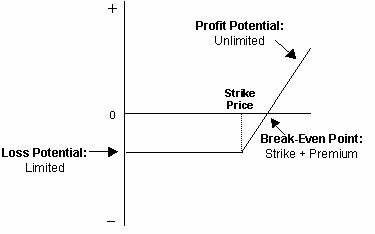 By selling the option the trader will basically agree to sell shares of the underlying asset at the strike price of the option. In this way he will be capping the upside potential. But let’s make an example to get things a bit more clear: let’s imagine that a trader buys 1,000 shares of BP at $44 per share and at the same time he will write 10 call options (1 contract per 100 shares) with a strike price of $46 that will expire in one month. In that case the cost per contract will be $25 and $250 will be the total amount for the 10 contracts. The $0.25 premium will reduce the cost on the shares to $43.75 and any drop in the underlying asset to this point will be offset by the premium that it will be received from the option position: in this case it will therefore offer some downside protection. If the share price will increase above $46 before that the option will expire, the short call option can be exercised (also called ‘called away’) with the result that the trader will have to deliver the stock at the option’s strike price. If this will happen the trader will close with a profit of $2.25 per share which is $46 strike price – $43.75 cost basis. Having said that we need to highlight that in the example the trader do not expect BP to move over £46 or significantly below $44 in the next month. If the shares do not go above £46 and get called away before the option will expire, the trader will be able to secure the premium free and also continue selling calls against the shares if he wants to. Risk/Reward: If the share price will increase over the strike price before it will expire, the short call option can be used and the trader will than have to deliver shares of the underlying asset at the option’s strike price. This will be also if the it will be below the market price. As a return from this risk, a covered call strategy has the advantage to provide limited downside protection in the form of premium when selling the call option. Own the underlying asset and want downside protection. The protective put is a long put similar to the strategy we have seen above. The goal of this strategy tough is to offer protection rather than making a profit from a downside move. Let’s imagine that a trader owns shares and he is bullish on the long run he can use this protective put strategy to protect against a potential decline that can happen in the short run. In the case the price of the underlying asset will increase above the put’s strike price at maturity than the option will expire worthless and the trader will lose the premium but overall he will still benefit from the increase in price of the underlying asset. If however the underlying asset price will decrease the trader’s portfolio will lose value but this loss will be offset by the gain from the put option position. So you can think about this strategy as an insurance strategy. In the table above the cost of the protection will increase with the level thereof. Let’s do an example: if a trader wants to protect the investment against adverse drop in price, he can buy 10 at the money put options at a strike price of $44 for $1.23 per share (or $123 per contract) with a total cost of $1,230. If the trader however is prepared to tolerate some level of risk he can also decide to buy less costly out of the money options like for example $40 put. In this case the cost of the option position will be a lot lower at only $200. Risk/Reward: If the price of the underlying asset will stay the same or it will increase the loss will be limited by the option premium that will work like an insurance. If the price of the underlying asset will drop significantly the loss in capital will be offset by the increase in the option’s price. In the example we have made at the strike price of $40 the loss will be limited to $4.20 per share which is $44 – $40 + $0.20. So with options traders have alternative strategies to profit from trading underlying securities. There are many strategies that do involve lots of different combinations of options: in this article we have outlined some basic strategies for beginners that include buying calls, buying puts, selling covered calls and buying protective puts. As you have seen there are many advantages in trading options instead of the underlying assets and those are downside protection and leverage returns. There are however also some disadvantages to consider like the requirement for upfront premium payment for example.